Herc shows off his skrill. Part of my Science Fiction consumption includes TV; here are my ratings. These include those currently airing, and also on-video blasts-from-the-past. Babylon 5  why don’t most people realise how great this is? Not only does it have a plot, but that plot unfolds intelligently, surprisingly, and enjoyably! The Hitchhiker’s Guide to the Galaxy  1978  theRADIO series, of course. By Douglas Adams. Starring PeterJones as The Book. 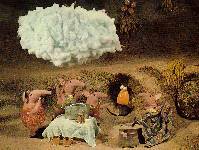 The Clangers  1969-1974  knitted pink whistling puppets, plus Blue String pudding, the Iron Chicken, the Soup Dragon, and the Froglets. Dark Skies  1997  paranoid conspiracy theory of alien invasion. Red Dwarf I–VI  1988-1993  a comedy SF series that really is funny, and SFnal! The Water Margin  “Robin Hood in China”: hero-outlaws fight a corrupt government. Ivor the Engine  of course it’s SF: it’s got a dragon in it! Noggin the Nog  of course it’s SF: it’s got a talking bird in it! Third Rock from the Sun  1996  Comedy as four aliens take on human form to research us. "Why did I have to be the woman?" "Because you lost." Thunderbirds  1965  Gerry Anderson’s puppet International Rescue Service  longer episodes allowed more complex plots, and the model equipment often looked realistically ‘used’: battered and grubby (no, Star Wars wasn’t the first to do this).  "F.A.B., Scott!"  Like all Anderson shows, the covert organisation is remarkably lightly staffed: what happens if someone gets sick, goes on holiday, wants to leave, or even just wants to sleep? and where are all the maintenance and ground crews? Timeslip  1970  Liz and Simon slip back to a WWII incident, then forward to The Icebox , an Antarctic research station, then forward to a different future in The Burn Up , where planetary engineering is destroying the climate, then back to the present to discover a clone conspiracy. They meet various versions of themselves, of their parents, and of Commander Traynor, sort out what’s happening, and eventually save the day. Batman  1966-69  "Holy weird camera angles, Batman!" Beauty and the Beast : Vincent (Ron Perlman) is a mutant living under New York, and Catherine (Linda Hamilton) is his friend above. Captain Scarlet  1967  Gerry Anderson’s Spectrum versus the Mysterons puppet adventures, led by the indestructible Captain  "This is the voice of the Mysterons"  morally ambiguous: we blow them up in an unprovoked attack, then get upset when they strike back  "Spectrum is Green"
The Champions  1968-69  three UN Nemesis agents are given superpowers by Himalayan gurus, and become "the Champions of Law, Order, and Justice". Cleopatra 2525  "in the year 2525..."
Red Dwarf VII  1996  the eagerly awaited return, but what a bitter disappointment! Space 1999  1975  Gerry Anderson would have us believe an explosion on the moon blows it out of orbit [on 13 September 1999, fortunately after the 11 August 1999 total eclipse of the sun ], which incredible event occurs without destroying Moon Base Alpha  the moon then behaves as a spaceship, travelling round the galaxy, having various alien adventures. The Tomorrow People  1973-79  a few children ‘break out’ with psi powers, which make them telepathic and let them ‘jaunt’ (teleport). U.F.O.  1970  Gerry Anderson’s move into live action (with all the obvious jokes): it is 1980, and (surprisingly humanoid) aliens are stealing human organs for their own use. Early conspiracy stuff: SHADO, fighting the aliens, is a covert organisation  but how do they keep Moonbase secret? Have the old ones just not stood the test of time, or were they really that bad first time around? Early Edition  1997  The protagonist gets tomorrow’s newspaper, and can prevent the tragedies. Great premiss, cloying realisation. Joe 90  1968  just what would the Social Services say today? Land of the Giants  most of the SFX were done with camera angles. Lost in Space  I would have spaced Dr Zachary Smith in episode 1. Bill Mumy (Will Robinson) grew up to play Lenier in the infinitely superior Babylon 5 . The Visitor  1997?  A pilot lost in the Bermuda Triangle in 1944 is returned today, with some mysterious mission to complete, possibly that of enacting every cliché in the book.